Manion may be a small-stakes grinder per usual, but hey — so was Ryan Riess. Manion’s first WSOP event ever, he wouldn’t normally have made the trip out to Vegas from Michigan, but his friend made him an offer he couldn’t refuse. The first day of the tournament was going smooth and he was building, but then he flopped the nut straight with jack-ten on seven-eight-nine, and got in stacks with an opponent who held top two with nine-eight. A nine on the turn left Manion down to 20,000 and he ended the day very short. Manion proceeded to chip up from there for the remaining few levels of the day, and made a huge laydown with pocket kings preflop at the very end of the night to preserve his stack and finish the day ninth in chips. Manion opened to 500,000 with blinds at 100K/200K/30K and Alex Lynskey three-bet to 1.5 million. 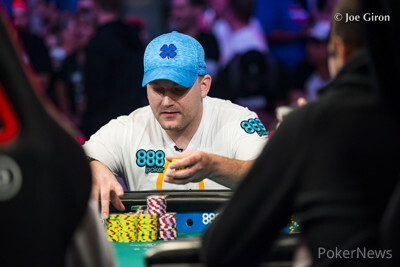 After Barry Hutter moved in for his last 580,000, Manion four-bet to 5 million. Lynskey moved in the rest and the decision was for a large chunk of Manion’s remaining stack. Manion filled us in on his thought process just after the hand. On Day 7, Manion chipped up early and stayed near the top of the counts all day. Then, a privotal hand went down after the final ten took their seats at the unofficial Main Event final table. “So I try to tank a little bit and make it look like I don’t have a huge monster, but I eventually shove and seat nine [Labat] tank-calls and they both have pocket kings. And somehow, this is real life. 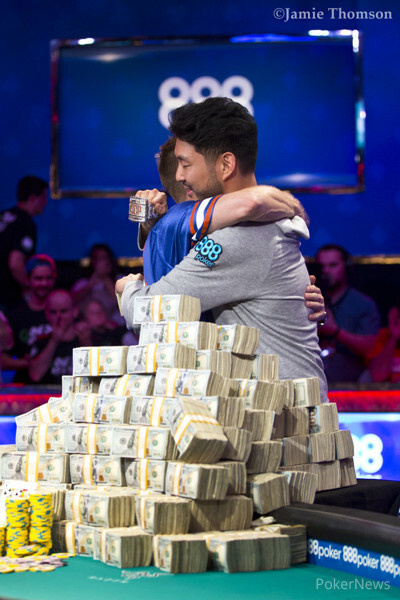 With Zhu as the shortest of the three, he was eliminated in the hand and Labat was knocked down to short-stack status, while Manion took over the chip lead long-held by Michael Dyer. Though Manion is not accustomed to playing for such high-stakes, he’s keeping his cool and says that being chip leader won’t change up his game. As a mostly $1/2 casino and home game player, Manion doesn’t have any aspirations of straying from his lifestyle back home in Michigan, where he also enjoys hanging out with his dogs at the beach near his home. Some of those buddies will undoubtedly be cheering Manion on, railside, just as they did when he charged into chip leader status in that fateful, final hand on Day 7.